Jimmy Jumps House/Hostel i Vilnius, Litauen: Reservér nu! Oversat af Med 'en gratis ævle Morgenmad at dø for "og" en feel-at-home atmosfære «, Jimmy Jumps Hostel vil ikke skuffe. Vandrerhjemmet tilbyder en imponerende oversigt over ture og aktiviteter (du kan prøve alt fra 'maskine pistol Tours' til 'Skov saunaer «) og med en comfy fælles rum og udendørs terrasse, er der masser af muligheder for at møde nye mennesker. Du kan nå Jimmy Springer let fra den centrale busstation, og dens centrale beliggenhed gør det nemt at udforske den gamle bydel største sites. Tjek torvet og rådhuset, kun 5 minutters gang fra vandrerhjemmet hoveddøren. 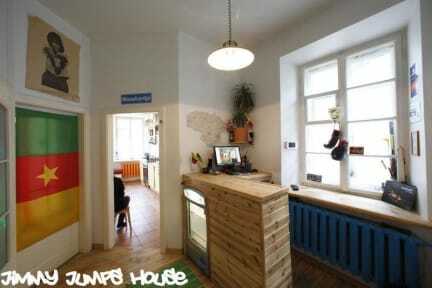 Voted #1 hostel in Lithuania in 2012 and 2013, Jimmy Jumps House is located in the heart of Vilnius' Epic Old Town. A 10 minute walk from the bus/train station, and just 50 steps from the main square and town hall, right in the middle of all the best restaurants, bars, pubs and clubs that you would expect on these ancient and chilled out Old Town streets. 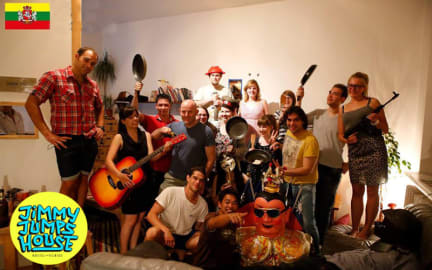 A small but lively hostel, where you will find a more personal and unforgettable experience. Our dorm rooms are filled with travelling stories, photos and artefacts, a balcony, a plush common room, all with old town views, plus all the amenities like free WiFi etc expected these days from a top shelf spot, and a stocked kitchen with world famous fresh made waffle breakfasts every morning. Check in from 3PM, Check out till 12PM. Jimmy Jumps was created by a Canadian backpacker, and the facilities have been set up with the experience in mind that comes with backpacking through a large chunk of the earth. From personal electrical outlets in each locker, (so you can charge your laptop/cell phone etc without worries while exploring,) to having your beds ready-made for you, to free guided tours by locals, pub crawls and the popular Machine Gun Tour and more. Everything is ready and waiting!